"Standing Against Tyranny To Do the Right Thing"
In the final AGENTS OF S.H.I.E.L.D. 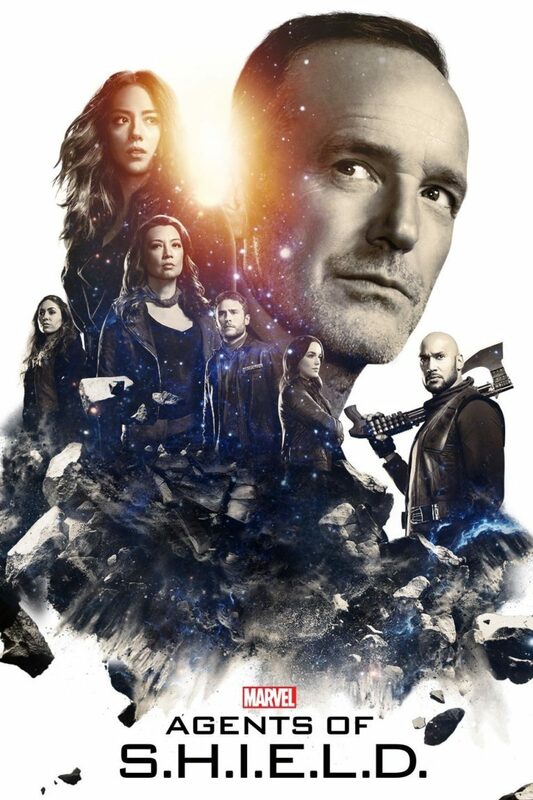 episode of Season 5, the agents have to decide whether to use a serum to save Agent Coulson’s life or stop an American general infected by a powerful force from destroying Earth. Super exciting and extremely poignant, the final S.H.I.E.L.D. episode of Season 5 has a very strong Christian, redemptive, moral worldview stressing helping people and doing the right thing, but caution is advised for some brief foul language and fairly light action violence. Season 5 of MARVEL’S AGENTS OF S.H.I.E.L.D. has Agent Coulson and his team facing their biggest threat ever. At the beginning of the season, the team finds themselves taken hostage, and they awaken on a strange space station. The team includes Coulson, Agent May, Daisy Johnson/Quake, the scientist Jemma Simmons, Mack, and the blazing fast inhuman mutant female nicknamed “Yo-Yo.” The only person missing is Fitz, Simmons’ partner. The team immediately discovers that there are dangers on the space station. First, they run into deadly creatures, and then to make matters worse, they run into Kree soldiers, a blue, violent alien race. Marvel fans will remember that the villain in GUARDIANS OF THE GALAXY, Ronan the Destroyer, was a Kree. The team meet a man named Deke who eventually breaks the news to them that they’re 90 years in the future, and that 90 years ago, the earth broke apart because of a super powerful inhuman. They believe it was Quake’s fault. Since then, the Kree have enslaved any humans who survived. S.H.I.E.L.D must figure out how to get back to the past in order to stop whatever resulted in the Earth’s destruction. Season 5 of MARVEL’S AGENTS OF S.H.I.E.L.D. is one of the most fun seasons yet. Besides a few cheesy moments, especially from some of the actors playing the Kree, the series continues to entertain with high jeopardy storylines and emotionally driven characters. The jump in time is particularly intriguing. Creatively, the series continues to have ties to the larger Marvel Cinematic Universe, including a reference to Thanos and the events that take place in AVENGERS: INFINITY WAR. One of the strongest points of the show is the surrogate father/daughter relationship between Agent Coulson and Daisy Johnson. Not afraid to tackle moral conundrums, this season of MARVEL’S AGENTS OF S.H.I.E.L.D. surprisingly sides with moral objectivity instead of vague moral relativism. This struggle for the team is present in Mack and Yo-Yo’s romantic relationship. Mack is a Christian, and a man of deep faith, and Yo-Yo endures terrible struggles in this season that has her questioning her own Christian faith and what’s the right thing to do. The journey isn’t perfect, and people make bad decisions, but the conclusion is refreshingly and upliftingly moral. There are cautions for MARVEL’S AGENTS OF S.H.I.E.L.D. because of some light foul language throughout the season. Also, a little girls sees visions because of a special superpower that’s a little occult, and there are some slightly pagan notions concerning time travel. Otherwise, for teenagers and adults, MARVEL’S AGENTS OF S.H.I.E.L.D. might be the best superhero TV programs for mature audiences MOVIEGUIDE® has seen in many years. Season Five’s final AGENTS OF S.H.I.E.L.D. episode finds Agent Coulson dying of an incurable alien illness. Meanwhile, General Talbot has become the most powerful person on Earth. His body’s been taken over by gravitonium, a mysterious liquid metal that can consume other people. Talbot plans to mine the rest of Earth’s gravitonium, which lies under Chicago. The only way to stop Talbot is a serum Fitz and Simmons have concocted, but this serum also can heal Coulson. So, the team is divided on using it. Save Coulson; or, save the world? The episode “The End” is a powerful, exciting finale to Season 5, with emotional farewells to certain characters. There’s a very strong Christian, moral worldview extolling prayer, God’s judgment, helping people, even if it means making tough sacrifices. It also says you don’t have to be powerful to be a hero. In fact, if you enlist in a service that helps others, you’re already a hero. The episode has some violence and four obscenities. So, caution is advised. Otherwise, this is one of the best episodes of MARVEL’S AGENTS OF S.H.I.E.L.D.